From quick finger foods to fancy desserts, Calphalon's jelly roll pan is the most versatile baking pan you'll ever buy. The shallow sides are ideal for baking small-portion foods such as fries, fish fillets and breadsticks. 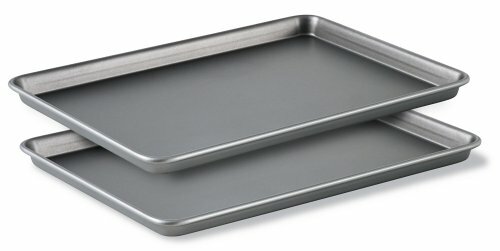 And our brownie pan is the preferred size and depth for brownies or other quick-bake cakes. Colors affect baking performance because they conduct heat differently. That's why our bakeware features a two-tone design: a silver grey surface underneath assures efficient baking time and a medium grey surface on top protects against overbrowning. Heavy-duty construction means no twisting or warping. And our advanced nonstick surface releases even sticky baked goods easily. Plus you can add the Calphalon 12" x 17" Cooling Rack to use as a roasting rack for roasting vegatables (or just as a cooling rack too! )!